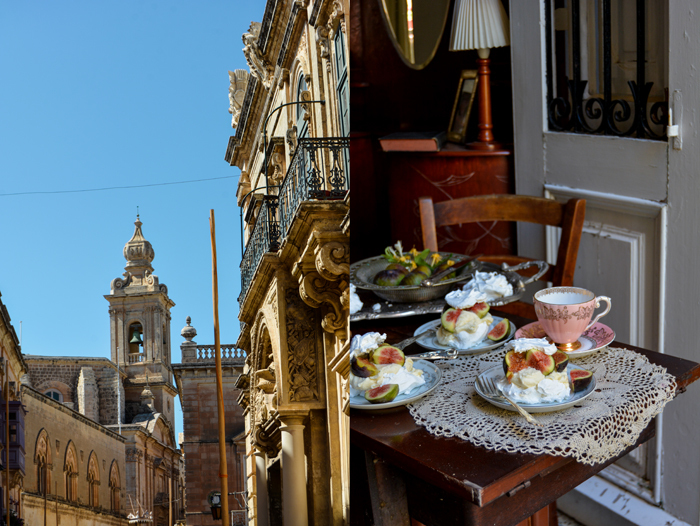 Most of the beaches and bays, restaurants and cafés, and markets and shops I visit in Malta are treasured finds of the past. Since I spent my first summer here 9 years ago, I gathered a long list of many places that I need to see at least once every time I come to the islands – I barely have enough time to discover something new. There are many traditions that I set up for myself, like my annual visit to the Sunday morning mass at Valletta’s St John’s Co-Cathedral, which is held in Latin and accompanied by the most ethereal choir. 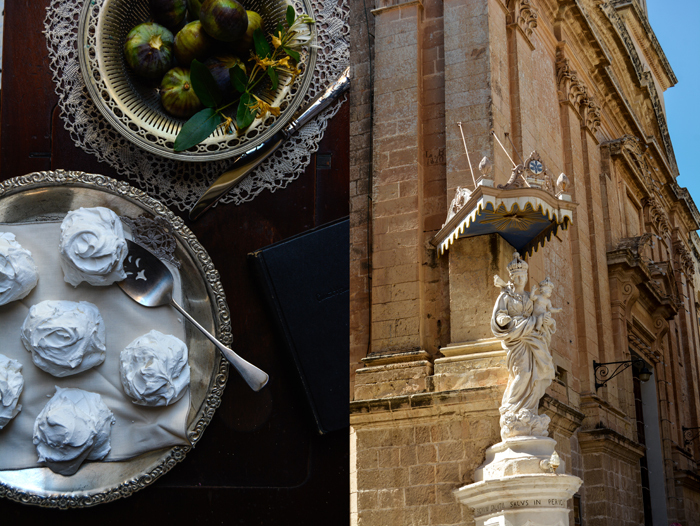 I went to this magnificent cathedral with my Maltese mama, the rest of the house was still asleep, and afterwards we enjoyed a strong cappuccino at Caffe Cordina. I recommend sitting inside with the locals, next to the bar and order some of their addictive treats. 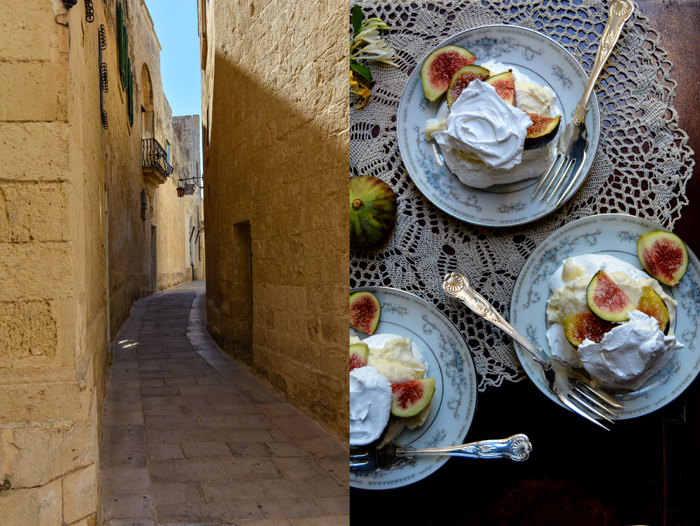 This time I went for spongy rum baba deeply soaked with sticky syrup followed by a buttery ricotta pastizzi – both were divine. 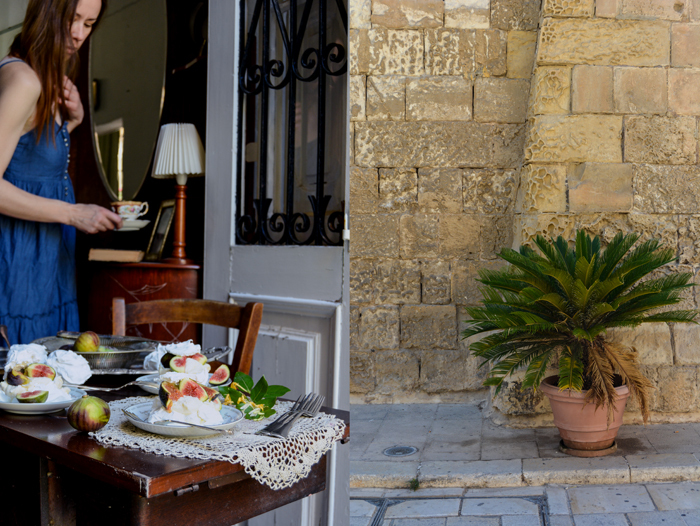 Fontanella Tea Garden in Mdina is another one of my favourite sweet spots. The view is breathtaking, sitting high up on a hill surrounded by ancient bastions, it allows you to see large parts of the island. 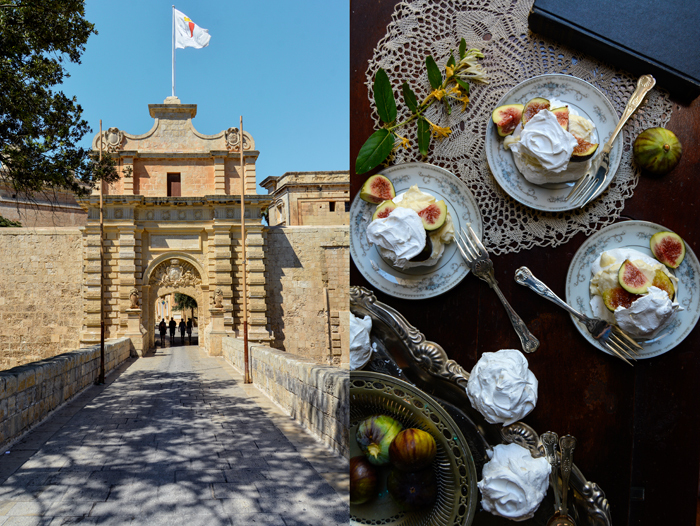 Their chocolate cake is a classic, dark and juicy and a must whenever I visit Malta’s old capital. But all these sweets are still not enough of a reason to keep the oven back home in Msida switched off. 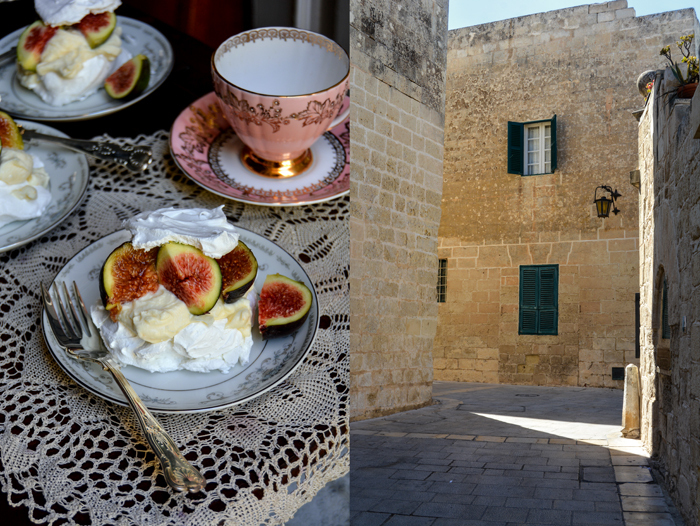 The antique furniture, plates, and cutlery that fill our family’s Malta home inspired me to come up with a dessert that suits all the beautiful lace doileys, fragile tea cups and silver tablets with floral patterns. 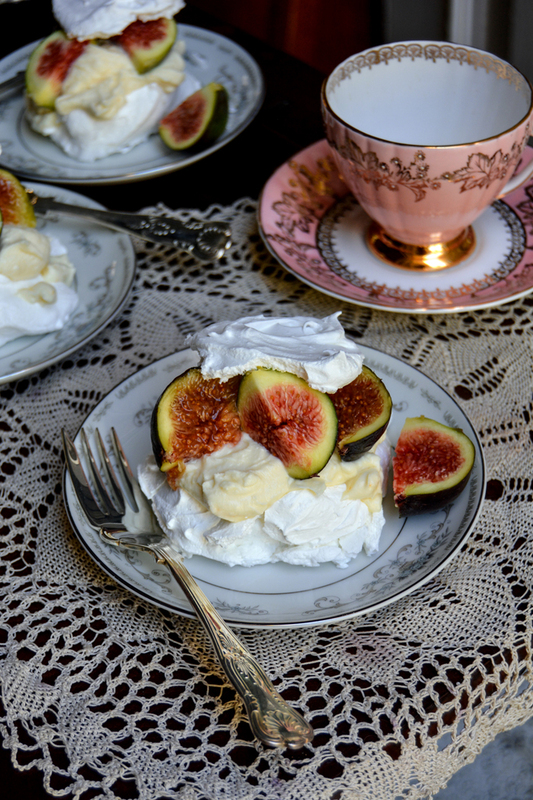 An elegant meringue, lusciously topped with whipped honey mascarpone and Maltese figs was just right – visually and in taste. It’s sweet and creamy, light and crunchy, with a juicy hint of fruit. Italian meringues are large and pale, crunchy on the outside and still a little soft inside. I preheated the oven to 160°C / 325°F, turned it off, and left the meringue in overnight, they came out perfect. The mascarpone whipped with a bit of heavy cream and warm honey was a nice contrast to the meringue’s crunch. It’s best to prepare the meringues a day ahead and leave them in the oven overnight. Preheat the oven to 160°C / 325°F (conventional setting) and line a baking sheet with parchment paper. For the meringue, in a large bowl of a stand mixer, whisk the egg whites and salt for 1 minute. Continue whisking for 15 minutes, adding 1 tablespoon of the sugar at a time. The meringue should be stiff and glossy, then whisk in the vinegar. Spoon 6 large mounds onto the lined baking sheet and, using a spoon, swirl the tops a little. Place the baking sheet in the oven, switch off the oven, and bake the meringues overnight (for about 8 – 12 hours), without opening the door. If the meringues are still too soft on the outside, turn on the oven again and bake for a few minutes until crunchy on the outside. For the honey mascarpone, in a medium bowl whisk the mascarpone and heavy cream until creamy, add more cream if necessary. Warm up the honey in a saucepan over low heat for about 1 minute until liquid and slightly warm, and stir into the mascarpone. Keep in the fridge until serving. 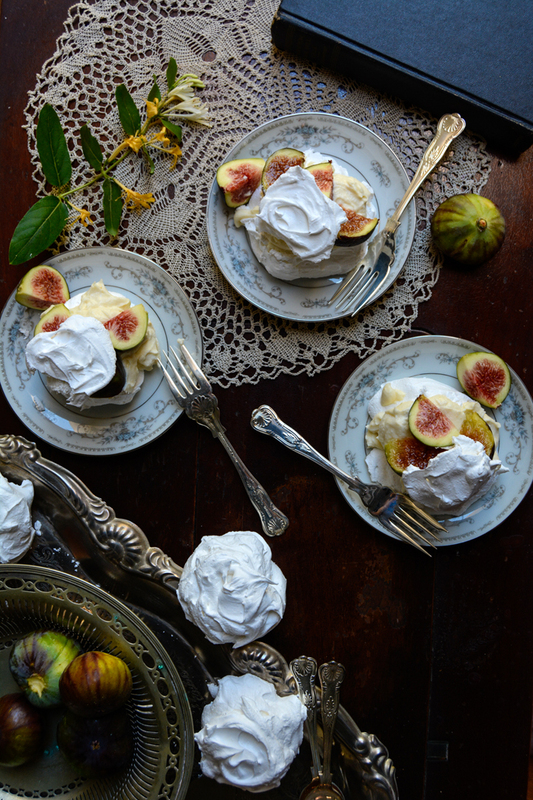 Cut a small top off each meringue, top with the honey mascarpone and figs, and close with the meringue tops. Serve immediately once the meringues are filled.